This Privacy Notice is being provided to you as a requirement of a federal law, the Health Insurance Portability and Accountability Act (HIPAA). This Privacy Notice describes how Monticello Community Surgery Center may use and disclose your protected health information to carry out treatment, payment or health care operations and for other purposes that are permitted or required by law. It also describes your rights to access and control your protected health information in some cases. Your “protected health information” means any written and oral health information about you, including demographic data that can be used to identify you. This is health information that is created or received by your health care provider, and that relates to your past, present or future physical or mental health or condition. 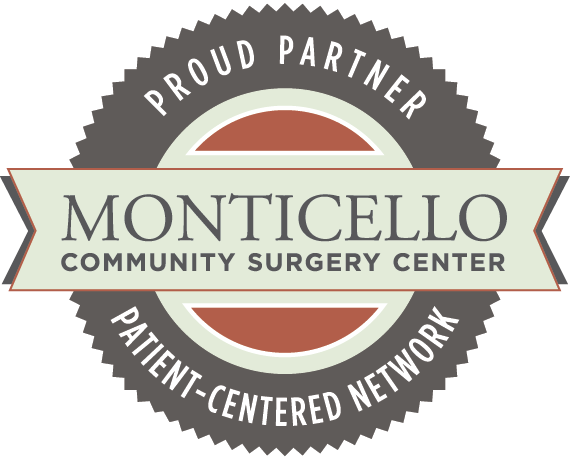 The Monticello Community Surgery Center and its affiliated anesthesia providers may use your protected health information for purposes of providing treatment and obtaining payment for treatment provided at the Monticello Community Surgery Center facility and for conducting health care operations. Your protected health information may be used or disclosed only for these purposes unless the surgery center or its affiliated anesthesia providers has obtained your authorization or the use or disclosure is otherwise permitted by the HIPAA privacy regulations or state law. Disclosures of your protected health information for the purposes described in this Privacy Notice may be made in writing, orally, by facsimile, or electronically. A. Treatment. We will share and jointly use and disclose your protected health information to provide, coordinate, or manage your health care and any related services. This includes the coordination or management of your health care with a third party for treatment purposes. For example, we may disclose your protected health information to a pharmacy to fill a prescription or to a laboratory to order a blood test. We may also disclose protected health information to physicians who may be treating you or consulting with the facility with respect to your care. In some cases, we may also disclose your protected health information to an outside treatment provider for purposes of the treatment activities of the other provider. B. Payment. Your protected health information will be used, as needed, to obtain payment for the services that we provide. This may include certain communications to your health insurance company to get approval for the procedure that we have scheduled. For example, we may need to disclose information to your health insurance company to get prior approval for the surgery. We may also disclose protected health information to your health insurance company to determine whether you are eligible for benefits or whether a particular service is covered under your health plan. In order to get payment for the services we provide to you, we may also need to disclose your protected health information to your health insurance company to demonstrate the medical necessity of the services or, as required by your insurance company, for utilization review. We may also disclose patient information to another provider involved in your care for the other provider’s payment activities. This may include disclosure of demographic information to anesthesia care providers for payment of their services. C. Operations. We may use or disclose your protected health information, as necessary, for our own health care operations to facilitate the function of the surgery center and its affiliated anesthesia providers and to provide quality care to all patients. Health care operations include such activities as: quality assessment and improvement activities, employee review activities, training programs including those in which students, trainees, or practitioners in health care learn under supervision, accreditation, certification, licensing or credentialing activities, review and auditing, including compliance reviews, medical reviews, legal services and maintaining compliance programs, and business management and general administrative activities. In certain situations, we may also disclose patient information to another provider or health plan for their health care operations. D. Other Uses and Disclosures. As part of treatment, payment and health care operations, we may also use or disclose your protected health information for the following purposes: to remind you of your surgery date, to inform you of potential treatment alternatives or options, to inform you of health-related benefits or services that may be of interest to you, or to contact you to raise funds for the facility or an institutional foundation related to the facility. If you do not wish to be contacted regarding fundraising, you may opt out by contacting our Privacy Officer whose contact information is listed on the last page of this Privacy Notice. A. When Legally Required. We will disclose your protected health information when we are required to do so by any federal, state or local law. • To prevent, control, or report disease, injury or disability as permitted by law. • To report vital events such as birth or death as permitted or required by law. • To conduct public health surveillance, investigations and interventions as permitted or required by law. • To collect or report adverse events and product defects, track FDA regulated products; enable product recalls, repairs or replacements to the FDA and to conduct post marketing surveillance. • To notify a person who has been exposed to a communicable disease or who may be at risk of contracting or spreading a disease as authorized by law. • To report to an employer information about an individual who is a member of the workforce as legally permitted or required. C. To Report Suspended Abuse, Neglect Or Domestic Violence. We may notify government authorities if we believe that a patient is the victim of abuse, neglect or domestic violence. We will make this disclosure only when specifically required or authorized by law or when the patient agrees to the disclosure. D. To Conduct Health Oversight Activities. We may disclose your protected health information to a health oversight agency for activities including audits; civil, administrative, or criminal investigations, proceedings, or actions; inspections; licensure or disciplinary actions; or other activities necessary for appropriate oversight as authorized by law. We will not disclose your health information under this authority if you are the subject of an investigation and your health information is not directly related to your receipt of health care or public benefits. • As required by law for reporting of certain types of wounds or other physical injuries. • Pursuant to court order, court-ordered warrant, subpoena, summons or similar process. • To law enforcement officials if the facility has a suspicion that your health condition was the result of criminal conduct. • In an emergency to report a crime. G. To Coroners, Funeral Directors, and for Organ Donation. We may disclose protected health information to a coroner or medical examiner for identification purposes, to determine cause of death or for the coroner or medical examiner to perform other duties authorized by law. We may also disclose protected health information to a funeral director, as authorized by law, in order to permit the funeral director to carry out their duties. We may disclose such information in reasonable anticipation of death. Protected health information may be used and disclosed for cadaveric organ, eye or tissue donation purposes. J. For Specified Government Functions. In certain circumstances, federal regulations authorize the facility to use or disclose your protected health information to facilitate specified government functions relating to military and veterans activities, national security and intelligence activities, protective services for the President and others, medical suitability determinations, correctional institutions, and law enforcement custodial situations. K. For Worker’s Compensation. We may release your health information to comply with worker’s compensation laws or similar programs. In some cases listed above, there may be more stringent laws which prevent the use or disclosure of protected health information for these purposes. In some cases, protected health information may not be used or disclosed without your written authorization. This includes use/disclosure of psychotherapy notes, use of protected health information for marketing purposes, and sale of protected health information. You may revoke your authorization in writing at any time except to the extent that we have taken action in reliance upon the authorization. A. The right to inspect and copy your protected health information. You may inspect and obtain a copy of your protected health information that is contained in a designated record set for as long as we maintain the protected health information. A “designated record set” contains medical and billing records and any other records that your surgeon and the facility use for making decisions about you. Under federal law, however, you may not inspect or copy the following records: psychotherapy notes; information compiled in reasonable anticipation of, or for use in, a civil, criminal, or administrative action or proceeding; and protected health information that is subject to a law that prohibits access to protected health information. Depending on the circumstances, you may have the right to have a decision to deny access reviewed. We may deny your request to inspect or copy your protected health information if, in our professional judgment, we determine that the access requested is likely to endanger your life or safety or that of another person, or that it is likely to cause substantial harm to another person referenced within the information. You have the right to request a review of this decision. To inspect and copy your medical information, you must submit a written request to the Privacy Officer whose contact information is listed on the last page of this Privacy Notice. If you request a copy of your information, we may charge you a fee for the costs of copying, mailing or other costs incurred by us in complying with your request. For any part of your record that we maintain electronically, you have the right to request an electronic copy. Please contact our Privacy Officer if you have questions about access to your medical record. B. The right to request a restriction on uses and disclosures of your protected health information. You may ask us not to use or disclose certain parts of your protected health information for the purposes of treatment, payment or health care operations. You may also request that we not disclose your health information to family members or friends who may be involved in your care or for notification purposes as described in this Privacy Notice. Your request must state the specific restriction requested and to whom you want the restriction to apply. The facility is not required to agree to a restriction that you may request, except that if you ask us not to send protected health information to your health insurer for an item of service when you have paid the full cost of that item or service out of pocket, we must comply with this request. We will notify you if we deny your request to a restriction. If the facility does agree to the requested restriction, we may not use or disclose your protected health information in violation of that restriction unless it is needed to provide emergency treatment. Under certain circumstances, we may terminate our agreement to a restriction. You may request a restriction by contacting the Privacy Officer. D. The right to request amendments to your protected health information. You may request an amendment of protected health information about you in a designated record set for as long as we maintain this information. In certain cases, we may deny your request for an amendment. If we deny your request for amendment, you have the right to file a statement of disagreement with us and we may prepare a rebuttal to your statement and will provide you with a copy of any such rebuttal. Requests for amendment must be in writing and must be directed to our Privacy Officer. In this written request, you must also provide a reason to support the requested amendments. E. The right to receive an accounting. You have the right to request an accounting of certain disclosures of your protected health information made by the facility. This right applies to disclosures for purposes other than treatment, payment or health care operations as described in this Privacy Notice. We are also not required to account for disclosures that you requested, disclosures that you agreed to by signing an authorization form, disclosures for a facility directory, to friends or family members involved in your care, or certain other disclosures we are permitted to make without your authorization. The request for an accounting must be made in writing to our Privacy Officer. The request should specify the time period sought for the accounting. We are not required to provide an accounting for disclosures that take place prior to April 14, 2003. Accounting requests may not be made for periods of time in excess of six years. We will provide the first accounting you request during any 12-month period without charge. Subsequent accounting requests may be subject to a reasonable cost-based fee. The surgery center and its affiliated anesthesia providers are required by law to maintain the privacy of your health information and to provide you with this Privacy Notice of our duties and privacy practices. We are required by law to notify affected individuals following a breach of unsecured protected health information. We are required to abide by terms of this Notice as may be amended from time to time. We reserve the right to change the terms of this Notice and to make the new Notice provisions effective for all future protected health information that we maintain. If the facility changes its Notice, we will provide a copy of the revised Notice by sending a copy of the revised Notice via regular mail or through in-person contact. The Privacy Officer can be contacted by telephone at 434.293.4995.